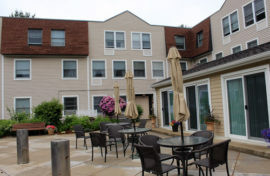 Reading and Braintree, MA (December 13, 2018) – Peabody Properties, a full-service real estate and property management firm (www.peabodyproperties.com), is pleased to announce Peter Sanborn Place has been named a finalist in the 2018 National Association of Home Builders (NAHB) Multifamily Pillars of the Industry Award in the Best Resident Services at an Affordable Community category. The winners will be announced during an awards luncheon on February 19, 2019, in Las Vegas during the International Builders Show. Peter Sanborn Place (PSP) is an age-friendly community that provides a safe, positive, healthy, and fun atmosphere that residents call home. PSP is an affordable community predominately designed for seniors 62 years and older as well as persons with disabilities under age 62. The residents enjoy a multitude of programs provided on-site by the Resident Services Team which is comprised of a Resident Service Coordinator (RSC) and Registered Nurse/Resident Care Coordinator (RN/RCC), who provide resources and assists residents with referrals to supportive services. This team approach is unique and enhances the supportive housing model promoting a vibrant independent lifestyle for residents living in the community. A multitude of partnerships have also been created between residents of PSP and the community, including with the Girl Scouts (providing intergenerational programs), local dance studios (providing performances), Reading Cooperative Bank (offering a satellite banking office on-site to assist residents with banking needs and provide financial literacy education), a monthly mobile library, and the local high school (proving student interns to assist with events and who organize ladder ball and corn hole games, weekly exercise classes through the YMCA, Tai Chi, and community meals). 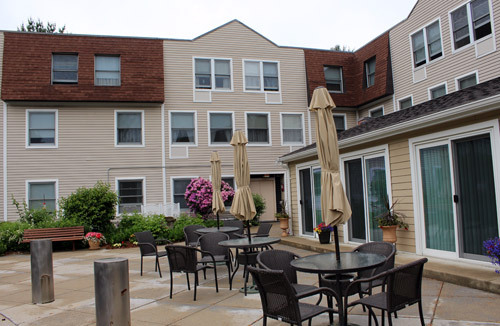 Health and wellness presentations, holiday activities, knitting, open mic nights, monthly entertainment, Wii bowling, board game tournaments, baking, rock garden, podiatry clinic, hairdresser, and traveling dental program are also services provided to the residents by the Peter Sanborn Place staff. Residents are also connected to the necessary supportive services they require to assist them with aging in place. “We are so appreciative for the NAHB’s recognition of Peter Sanborn Place as one of the best and the brightest in multifamily development excellence,” said Krystal Rodriquez, senior property manager for Peabody Properties. “Our team at PSP is uniquely enhancing the supportive housing services we offer, and doing a great job promoting vibrant independent lifestyles. It is important to all of us that our residents experience this next period of their lives as the best chapter, and our team works toward that goal on a daily basis. We are very proud of our PSP staff members, and congratulate them on this honor!